Sip hot tea with honey, relish the warm glow of an amber candle, and relax in an aromatherapy bath filled with essential oil salts to relieve muscle aches, mental and physical fatigue. After the much-needed soak, rehydrate with the engraved aluminum water bottle, perfect for on-the-go rejuvenation. 24 oz. Engraved Aluminum Water Bottle, Ceramic Bistro Mug. French Apricot Oil Soap, Amber Pillar Candle, Smith & Vandiver Bath Salts. Exfoliating Bath Sponge, DreamTime Sinus Soother Mask and more. Your gift is carefully assembled and accentuated by a hand-tied satin ribbon with optional personalization. A free card is included with your personal message or greeting, as well as complimentary scissors so your recipient can easily open their gift. 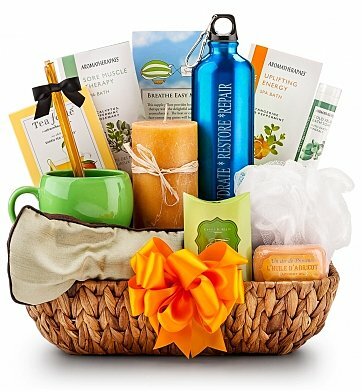 Your gift will leave a lasting impression as they continue to enjoy this elegant keepsake serving basket, perfect for organizing in the home or office. Luxury Spa Treatment Gift Set is a hand delivered gift. These gifts are delivered by one of our local design centers located throughout the United States and Canada. Same day delivery is available for most gifts when ordered before the cutoff time. The cutoff time for Luxury Spa Treatment Gift Set is in the recipient's time zone. Steven Smith Fez Green Tea SachetRare green teas from China are combined with aromatic spearmint grown in the Pacific Northwest and a hint of lemon myrtle from Australia. Just underwent major surgery and was surprised by this wonderful gift basket that arrived the day after I came home. Everything in it is first rate quality, all useable (meaning, no throw it in just to fill a basket items), pale colors of oranges, limes, and yellows meld together beautifully. Smell of everything is divine, and makes me smile every time I breath (and breathing isn't easy at the moment!) Peppermint and eucalyptus satin eye covers are dreamy, and allow me to drift to sleep peacefully anytime during the day. Can't wait to try the honey soap that smells like heaven! If I could leave a higher score then 5 stars, I would. We bought this for a silent auction for a fundraising event and I am pleased with it. The scissors and gift card for future use is a nice touch. I sent this to a new mommy from her new baby son - signed the card with his name (with his permission of course). Hormones notwithstanding, Mommy cried like a baby when she received the gift and of course, will relish the products as soon as she has ten minutes to take a bath. Thank you for the beautiful gift arrangement - superb! My daughter loved the basket! Very happy! She loved it! Thank you! I sent the luxury spa treatment gift set to a friend who is having surgery. She called a raved about how nice the basket is. Since I only saw it on the computer, I was curious to know if in fact is was nice. She couldn't say enough nice things about the basket. She really loved it! Everything my daughter-in-law needed, after weeks of hard work, for relaxing. I ordered this for my boss after she had surgery and she absolutely loved it! It was everything she could use. She was quite impressed with the scissors that opened it. I would definitely order this basket for someone else as a get well gift. We bought this for my sister-in-law and her husband when they celebrated their 30th wedding anniversary at the hotel where they honeymooned on Cape Cod. They absolutely loved it and enjoyed pampering each other. We were so glad that we decided to use your site to find their present. Gave this to my sister-in-law who loves to go to the spa. She loved it since she has just moved to a new city and hasn't found a spa to go to, she can relax at home until she does. The person to whom I sent this said it was very nice because it had a little bit of everything to help pamper her. My mom loved the gift! She loved the teas and the mug and especially the water bottle. This gift was perfect and it fit her perfectly! I'll definitely be buying from this website again. Thank you so much! !